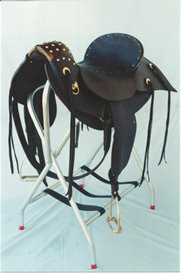 Hellhound Saddle. Our Hellhound, circa late 1700s - early 1800s, is styled from an original in our private collection, reproduced on new wide tree, with leather girth, brass stirrups, and all brass hardware, $1035.00. Available in mahogany (as shown) or black.